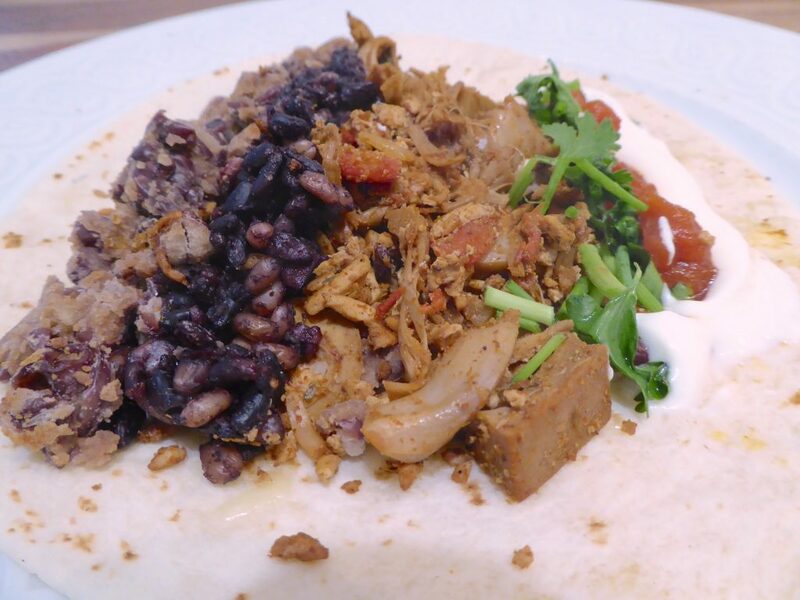 Multi-textured vegetarian ‘burrito’ fusion with Jackfruit, Pressed Tofu, Freekeh, and Adzuki beans are seasoned here with a variety of yummy spices. In keeping with this month’s theme of textures, this month’s improvised music features myself on piano and preparations (Amongst many things, preparations include sticky tack and video tape for percussive and string like sounds) in collaboration with David Story (percussion) and Adam Scime (Double Bass). The recording was a live recording taken at the Audiopollination improvised music series in Toronto in October 2017. Green jackfruit is not ripe yet, so it’s not sweet. Instead we prize it for its texture resembling shredded meat as it can add a hearty texture to an otherwise mushy bean burrito. Combine that with grated pressed tofu (a firm tofu that has less water content), you’ve got a winning combo. Whole grains Freekeh and Black rice here add the extra benefit of nutrients from their hulls than plain white rice and give a chewy whole grain texture and beautiful colorful look. Adzuki beans add another dimension of protein and nutrients. Use any bean (black bean, etc.) you like though. Beginning fromthe left of the photo, we have smashed seasoned adzuki beans, seasoned purple rice and freekeh filling, seasoned jackfruit tofu filling, and toppings. Spices: You can definitely improvise here. I used Clubhouse brand Texas spice, and Clubhouse brand Chilli spice. I also used smoked and regular paprika, as well as ground cumin. Feel free to use a similar seasoning mix. Heat a bit of oil (approximately 1 ½ tbsp.) on a non-stick pan on medium-high heat. When the oil is hot, throw in approximately 1 tbsp of Texas spice, half tbsp. of chilli spices, half tbsp. of cumin, and a dash of smoked paprika and regular paprika. Heat for a minute to bring out the flavours. Turn down the heat to medium. Throw in the grated pressed tofu, and stir quickly to coat spices. Add chopped vine tomatoes and green jackfruit and with your cooking utensil, try to break apart the jackfruit as much as you can. Continue to cook at medium-low heat. Adjust spices, and add salt to your liking if necessary (If you use jackfruit in brine like me, you won’t necessarily need to add any or much salt) until tomato juices start to run drier and jackfruit and tofu mixture look like it has absorbed the liquid. 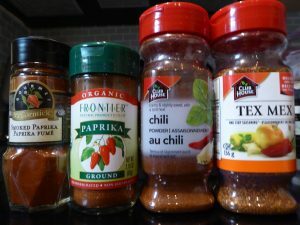 Spices I used: I had a premixed Gumbo seasoning. 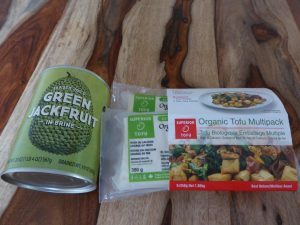 If you don’t have gumbo seasoning, feel free to use any mild seasoning that you would imagine will complement the jackfruit tofu filling. Presoak freekeh for about 4 hours or until overnight and rinse rice. Discard water (water a plant). Place rice and freekeh together in a rice cooker and add approximately ½ tbsp. of gumbo seasoning. Place about double the water, but according to rice cooker instructions. Directions: Soak desired amount of beans overnight. I used approximately 2/3 cup. Rinse beans. Boil beans. Turn down heat and simmer until cooked (about 60 minutes). Drain the beans and smash them. Heat a non-stick pan on medium heat. Put water or oil (to prevent beans from sticking to pan) and put smashed beans . Lightly sprinkle with a light dusting of ground cumin, and a bit of Texas spice and chilli spice. Combine and mix until seasonings are evenly dispersed. Add salt to your taste. On a pan or in a toaster oven, heat up a burrito wrapper with grated cheese of your choice ((I used a caramelized onion cheddar but you can use a different cheese) on top (as much as you want) until the cheese just melts. When the wrapper is warm and cheese is melted, put a spoonful or two of the jackfruit tofu filling, red adzuki bean filling, and freekeh black rice filling. Top with optional toppings below and fold up or roll up and eat. You may need a fork to pick up toppings that fall out. Vegan? Omit the sour cream and melted cheese. OR use a vegan substitute. Toppings you can add include fresh cilantro and green onions, as well as sour cream, and salsa to your taste. This is placed on top of a burrito wrapper with grated melted cheese of your choice. Like to keep things fresh? Subscribe to “Freshly Made” blog -- stay in touch, receive improvised veggie recipes and freshly improvised music monthly.